I know that toddlers throw tantrums. It’s a widely-known fact, at least among the parent community. Yes, I know they happen at seemingly random times, I know they happen at expected times (Oh, he wanted the chicken nuggets but now he wants the mac and cheese?) and I know that every time is inconvenient. Yesterday, my son threw a tantrum. He’s thrown one before, like his sister before him. I typically just wait a minute or two and distract him with something. But this time… this time was different. Y’all, I’ve never seen anything like it. Bring out the big guns, Mom. I scoop him up with one hand (I’m still holding D’s carseat in the other.) and carry him out the door. He’s screaming and flailing so hard I’m losing my grip, so we plop down in the courtyard. We’d made it about 20 feet. I let him lay there and holler, then scoop him up again. At this point, EK is sweetly following behind me, carrying J’s backpack. Bless her sweet heart. We made it another 20 feet before I almost dropped him on the asphalt. At least by now we were across the little road to the parking lot. I let him lay there another minute or two, gearing up for the next big push to the car. EK is still being her sweet self, and D is squinting in the sun, ready to be angry at a moment’s notice. I football-hold J on my hip (he’s sideways) and haul him and D the last 20 feet to the car. He’s FREAKING OUT, tears, snot, gasping for breath between screams. At this point I’ve passed through the “These things happen” stage into the “Oh my gosh is he going to asphyxiate? !” stage. I’ve put him down next to the car, and he’s laying on the pavement on his back, screaming his head off. EK climbs in the car, I put D down, and get to work stuffing J in his seat. I offer him water (“NO!”) and a snack (“NO!”) and give up. I manhandle him into his carseat, afraid I’m hurting him because of how I’m having to hold him down. He’s planking about as hard as I’ve ever experienced (His abs must be sore!) so it takes me several minutes to get him fully strapped. Still afraid he’s going to choke or puke, I carry a screaming D over to his side of the car and click his seat in. I close all the doors, and take a deep breath. The battle isn’t over. I call Hubby. No answer. This is an emergency, I think. Call him again, and he picks up. Over the screaming, I shout, “J is freaking out! I need you! I don’t know what to do! I’m worried about him!” Hubby walks me through turning on the in-flight movie. Thank God for cars with TVs. I don’t use it often, but in this case I pulled out all the stops. After 4 minutes of Despicable Me, he gets quiet. Not happy, but quiet. Finally, I remember the bananas. I managed to hand him a banana and get him to start eating it. I carry him upstairs while he’s eating the banana and get his juice from the fridge. Only then did he finally calm down (and eat a second banana). It was a grand total of about 35 minutes of doing the craziest stuff I’ve ever seen (with the 6 or 7 minute movie break in the car). Then he took a 3 hour, 45 minute nap. AND I WOKE HIM UP so he’d sleep at bedtime. Poor guy had a hard day. 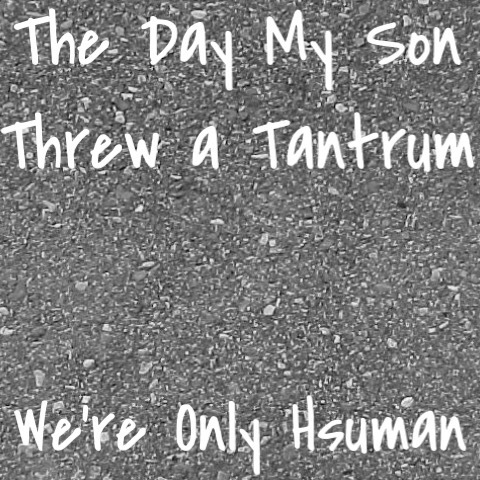 Oh wow, I am so not looking forward to the tantrum stage (and I was a big tantrum-thrower, so I know it’s going to happen with Little Boy). Haha ours definitely aren’t this bad every time! !